Wow I can’t believe Burning Man 2017 is already fast approaching. As we looked back at our blog we realized it’s been almost a year since we last posted about our progress on Darwin including her first trip to the playa last year! Last year we worked hard, learned a lot and had a ton of fun with friends and volunteers on the project. One thing we learned is that we need to find someone to help us blog ;). 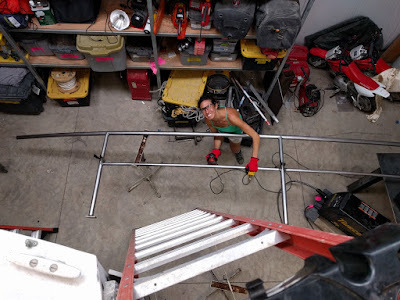 The other big learning for us was the understanding that this is going to be a longer duration project than we had originally anticipated given its engineering complexity and our desire to make sure Darwin is as safe as it is fun. 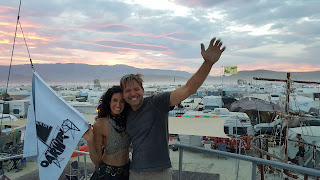 On August 25, 2016 Darwin rolled onto the playa for her first burn. Even though we did not have enough time to get Darwin walking in time for the burn last year, we still wanted to trailer her out and showcase the project and enjoy the fruits of our labor thus far. 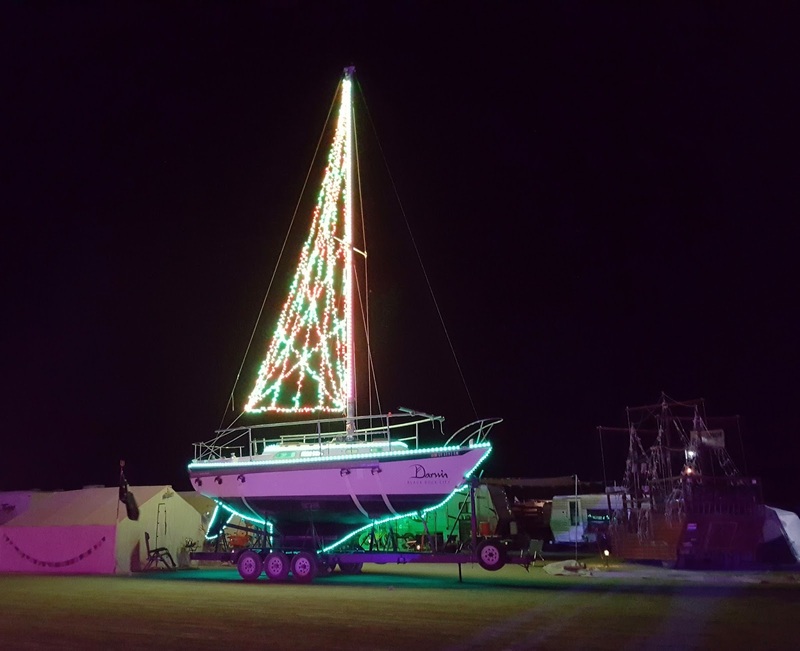 While Darwin may not have been walking (yet), she was quite the centerpiece at our camp and stood out at night with a 30 foot mast adorned with a LED sail that lit up the skies … and our way home ;)! 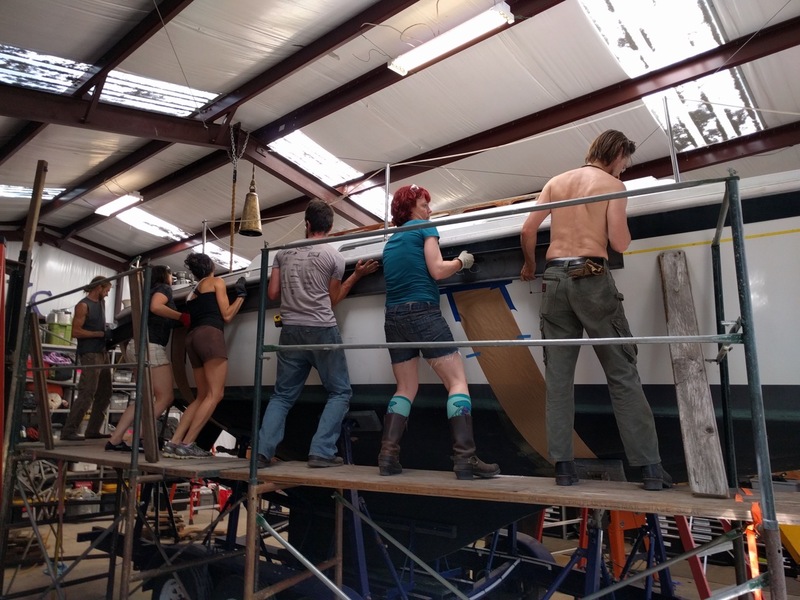 All Summer long we had volunteers came up to Healdsburg and contribute countless hours on the project. Many of the volunteers learned new skills like welding, soldering, grinding, sanding, drilling and more! 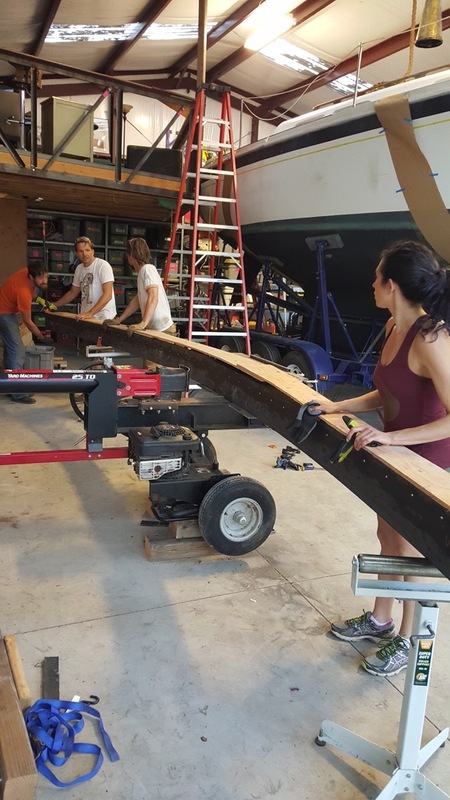 Attaching two 20 foot steel C-channel beams to either side of the sailboat which had to be bent to perfectly mold to the hull of the boat. This was no small feat! 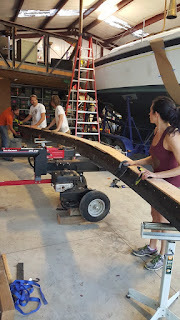 These curved c-channel beams act like the frame or chassis of the boat which the legs will attach to. This was one of the largest efforts last year since we had to bend the steel ourselves onsite, grind, paint, drill and attach each one with over 60 bolts per beam! 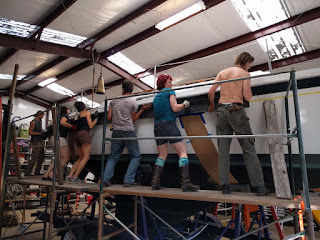 It took 6 people to lift and hold the c-channel in place! 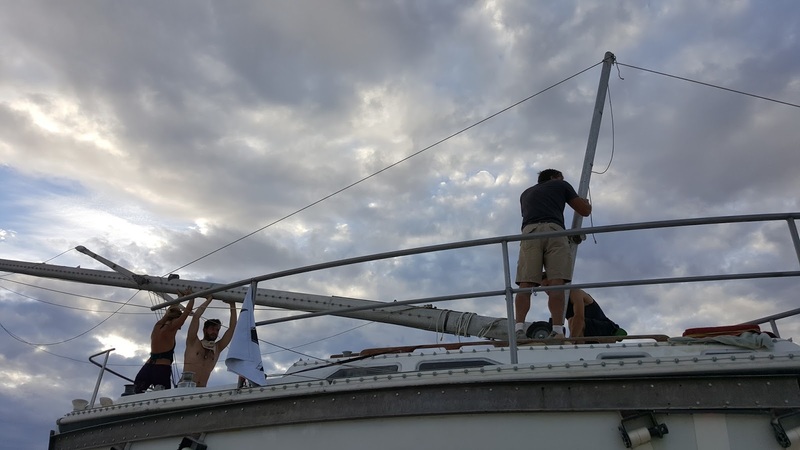 Given safety is of the utmost importance and sailboat are typically only equipped with a somewhat thin and flexible wire to hang onto when on the open waters, we knew we needed something MUCH sturdier on the playa. 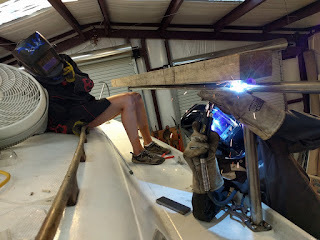 So we built strong steel railings that we custom cut, welded and bolted to run along both sides of the boat. The railings are tall enough to allow people to stand and safely hold on while they stand on the boat yet had to telescope down for transport it could clear low bridges. 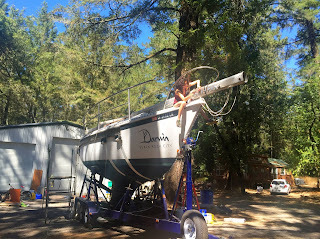 While the main focus of Project Darwin is to create the 3 pairs of mechanical legs that will walk the sailboat along the playa, we also wanted to create a fun interior space that was cozy, warm and functional. To create this space we had to almost gut the existing space including removing the 300lb engine using a jeep and a winch. We made new custom plush cushions for all the benches and removed the old stove and cabinets to install a small refrigerator. We re-wired the boat with 2 large batteries, installed 10 new of outlets and a lighting control box. We installed controllable LEDs along the ceiling and downlighting LEDs throughout the entire inside edge of the boat where individual holes had to be drilled for each light. It was a beautiful lounge that was a cozy hangout throughout the week. Raising the mast on the playa ... no crane! 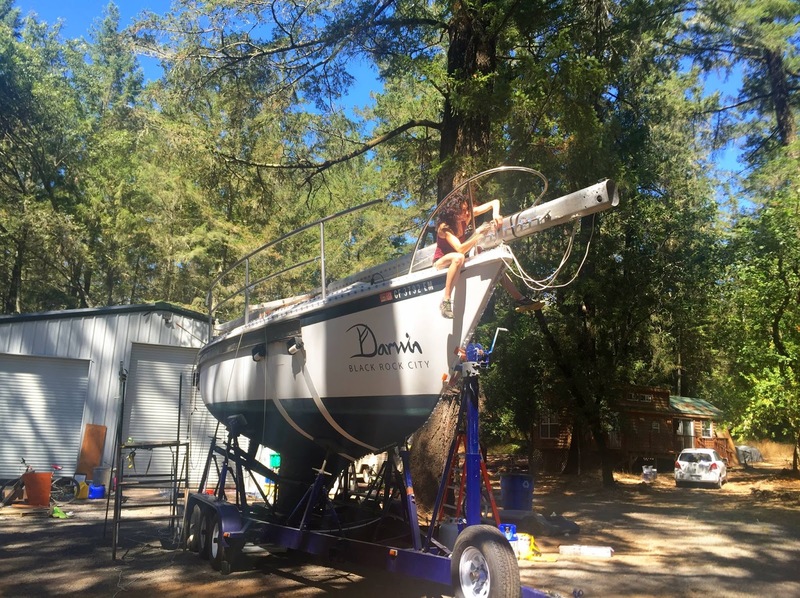 There are many other accomplishments that allowed us to take Darwin to her first burn like welding on a telescoping ladder, installing and programming ALL of the LED lights on the hull and sail, creating the signature Darwin name on the hull and more. We’re so grateful for all the people that helped on the project and excited for what we’ll accomplish and bring to the playa this year! Stay tuned for more updates … for real this time :)!